Modified the graphic based on new understanding of the two age model. …by this age they [the New Testament writers] meant and could mean nothing else than the current period in which they were living, the then present age. The age to come, the Messianic time, would accordingly be the period that would follow immediately after the termination of the pre-Messianic age. That time had not yet come when Jesus spoke. 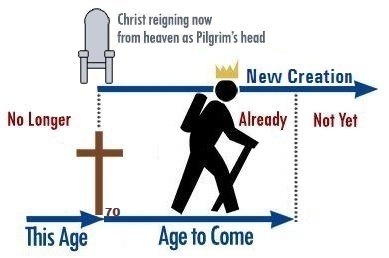 According to the whole trend of New Testament teaching that age and the Messianic kingdom were near or at hand. Christ’s ministry fell in the last days of an aion. The ministry both of Jesus and His disciples must, therefore, be recognized as occurring in the latter days of an aion, or near the end of the pre-Messianic age. The New Testament writers, as well as Jesus, are clear on this point. They never represent themselves as already entered upon the first days, or the beginning of the age, but rather in the last days. The ruin of the temple was, accordingly, the crisis which marked the end of the pre-Messianic age. The “last days” were from AD 30 to AD 70. While Jesus’ first advent marked the beginning of the new covenant age (the “age to come”), the old covenant age (“this age”) was finally swept away when Jerusalem and its temple were destroyed. There was a transitional period of 40 years (a generation) from AD 30 to AD 70 in which the two ages co-existed. Those were the “last days”.